Sadiqa Reynolds of Louisville Urban League explores race and discrimination and gives an inspiring challenge that the time for change is now. She has served as District Judge for the 30th Judicial Court. She was also the first African American woman to clerk for the Kentucky Supreme Court when she served as Chief Law Clerk for the late Chief Justice Robert F. Stephens. Her life as a public servant has also included being the first African American to serve as the Inspector General for the Kentucky Cabinet for Health and Family Services. There she worked to ensure regulatory compliance and integrity in programs and facilities responsible for providing quality health care, child care and related services, as well as working closely with the Center for Medicaid/Medicare Services in the Federal Government. As IG the ultimate oversight of the Kentucky All Schedule Prescription reporting program (KASPER) was also under her purview. Prior to entering the public sector, Sadiqa owned and managed a private legal practice for many years. Her practice included criminal litigation, employment law, death penalty litigation and serving as Guardian Ad Litem representing abused, neglected and dependent children as well as arguing successfully before the 6th Circuit Court of Appeals. She has also been recognized by the Louisville Bar Association for providing pro bono hours in which she represented domestic violence victims and other disadvantaged citizens. Sadiqa earned her BA in Psychology from the University of Louisville and her law degree from the University of Kentucky. She is a member of Delta Sigma Theta Sorority, Inc. and Bates Memorial Baptist Church. She has mentored and stayed connect with many young people and is passionate about making a difference in every life she is able to touch. She has worked to identify funding for programming in order to provide opportunities for young people in our community and spearheaded the move to create a liaison between the public school system and LMPD in order to assist children exposed to domestic violence. She is an advocate for mental health awareness and regularly works and speaks in order to reduce the stigma around mental health. She is also a proponent for Restorative Justice and participated in the face it campaign to end child abuse. Under her leadership, the Louisville Urban League is committed to jobs, justice, education, health and housing. Those who know her know that she is tenacious and dedicated to making a positive impact in the world. Sadiqa regularly serves as keynote speaker and through her community work has been recognized as a Business First Enterprising Woman to Watch, a Woman of Influence, been honored with a Tower Award, a Torch of Wisdom and been named a Daughter of Greatness by the Ali Center. 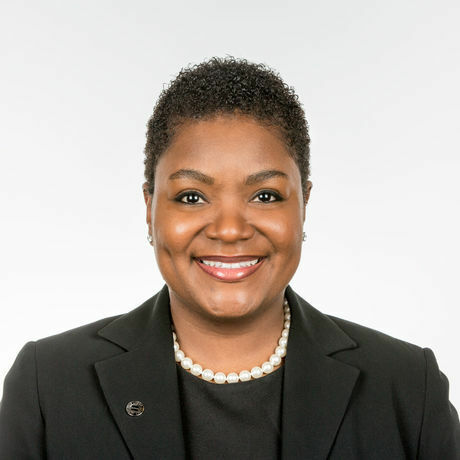 She’s received the Fannie Lou Hamer award, for her commitment to justice and in 2016 was named one of 100 Women to Watch in the country by Biz Women. Through her work at the League, she’s also been recognized as a Housing Advocate by the Mortgage Bankers Association. Sadiqa has been featured on public radio and in numerous print media outlets including Today’s Woman & NY Times. She loves to read and travel and has two phenomenal daughters Sydney, 11 and Wynter, 10, both of whom are being educated in the Jefferson County Public School System.